Welcome to Big Pink Link up party! Don’t worry you’ve not come to the wrong place, I am filling in for the lovely El over at AgentSpitback, while she is taking a well deserved rest and having some fun with her children before they head back to school. I am co-hosting this week with the lovely Hannah Jane. How has your week been? Did you have a lovely Easter and a nice week off last week? It’s been a bit of an up and down week this week for us, which you can read about here. But hoping this week will be better. The Big Pink Link is a Linky is for posts from parenting, to DIY, to crafts, to recipes, so feel free to link up what you want to share. I look forward to visiting your blogs, reading and finding out what you have been up to! Last time we had El and Kirsty from Winettes here are their WOWS from the last Big Pink Link Party. Do check them out if you haven’t already. And join in this week’s party. What great posts from a fantastic collection. Don’t forget to take the WOW badge if you got listed. Love, Life, Laughter and Loveliness. *You can link up one post each please. Giveaways are fine, but entering them is not a requirement to participate in the link up. *Swing by and post a comment on both the hosts’ posts and the post before you, any more is brilliant too. *The post will run each week from 9am on Monday until we have 75 entries. 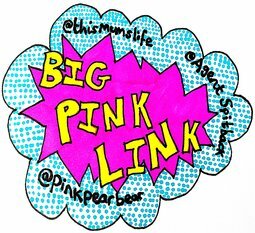 *Please use #bigpinklink when commenting on other blog posts so people know where you are coming from and tweet us your link over on twitter, @susankmann and @hannahjane_UK using the hashtag #bigpinklink so we can retweet you! Only two of us shall be running the link up each week, however, we may all retweet if we are able. *Please paste our badge to the bottom of any posts you link up. You can grab the code above to do this easily. If you link up, you are agreeing to be notified of subsequent link ups.